Download the MOV Merger to Acquire Better Viewing Enjoyment. Tired of switching between episodes of TV series downloaded from internet? A QuickTime video downloaded online were separated to multiple parts? Want to combine fragments that were shot by iPhone into a whole video? By reading this article, you will learn to merge MOV files and choose the best MOV merger. Here’s a simple and efficient video merger I highly recommend. For those who really need to merge QuickTime videos but having that sort of doubts because you have seen enough of the mind-crashing tutorials with complex steps and theories, I can guarantee that you worry too much. It doesn’t require you to study any difficult theories to combine MOV files, what you have to do is follow the instructions to find yourself a simple, useful and powerful merger, spend a few minutes to be familiar with it and merge MOV files with it, have a try! 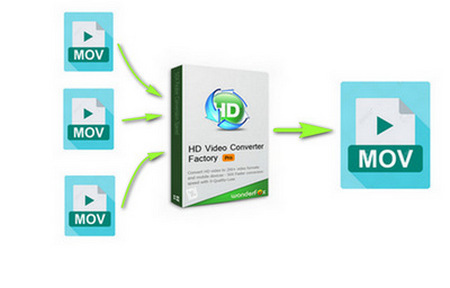 HD Video Converter Factory Pro is exactly the MOV joiner that meets all the requirements that I said. Besides, the process is extremely short and convenient, with a few clicks and drag several times, it’s done before you know it. You can choose video merger software or video merger online as you wish, they both have their pros and cons. That’s an efficient and convenient way if you don’t mind software installation. But you should learn to choose a good video merger. A good merger software should be efficient, multifunctional and easy to learn. If it has user-friendly interface and some additional functions like enhancing output video’s quality and doesn’t have any plug-ins, that would be much sweeter. 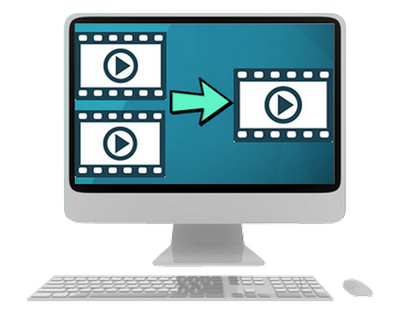 HD Video Converter Factory Pro is exactly what you seek for. 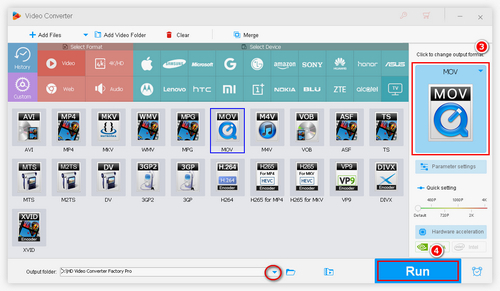 How to Combine QuickTime Videos with HD Video Converter Factory Pro? Load your source MOV files by clicking “Add Files” button or drag them to the central area of the main interface, then click “+Merge” button. 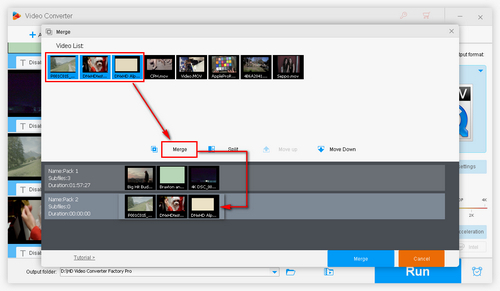 Select the files from “Original” area that you want to merge and click “+Merge” button to create a pack (one pack should contain two videos at least). Tips: After creating pack 1, select the files left from “Original” area that you want to merge into pack 2 and click “+Merge” button to create pack 2, and so on and so forth. You can change the order of display by dragging one of them. Then click “OK” button to go to main interface. Next, you can choose output format by clicking on the “Output Format” section on the right side of the interface. Which means you can maintain the original MOV format or convert the output MOV files to other formats like MPEG. 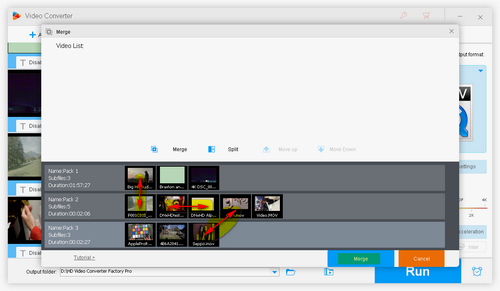 Then click “Run” button to export a brand new seamless MOV file! You will be noticed whether to open the output folder when it’s done. 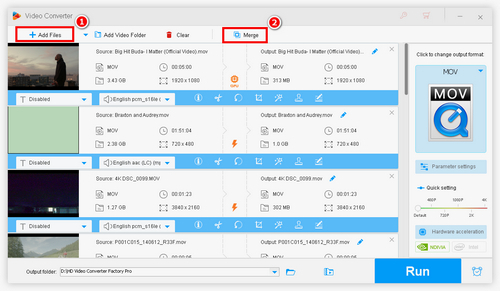 For experienced users or some other requirements, HD Video Converter Factory Pro allows you to merge videos of different formats (such as MP4, MKV, etc.). And you can trim the output video, add special effects, convert it to other format for further use, and even compress it if it’s too big. 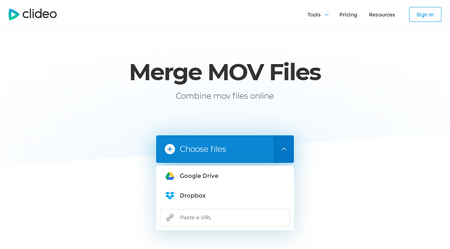 Merge Video Online is one of the greatest online video mergers, it’s online, it’s simple, it supports any popular upload/output format, and it’s free! That sounds more than enough for you and much simpler and cleaner than installing a software, right? But, on the other hand, the ad is super annoying, upload video size is limited to 300Mb and the speed of upload and output usually let you down. Besides, if your network connection is unstable, you’ll have a very bad experience. 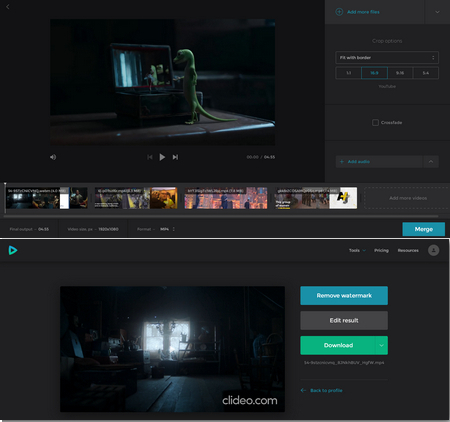 How to Combine QuickTime Videos with Merge Video Online? Click the Corresponding Button to Load Source Videos from Computer, Dropbox, Google Drive, URL. (1) Add more files if you missed anything. (3) Decide whether to have crossfade effect. Click “Download” button to download it to your computer. Now you have learned how to merge MOV files with software or online, choose the one that works for you by weighing the pros and cons. Personally, I highly recommend HD Video Converter Factory Pro. As a MOV joiner, it’s simple for beginners and it’s multifunctional and efficient for experienced users. What is a MOV file and What Can I Do by Merging MOV Files? MOV is QuickTime video format, a video format of multimedia container file developed by Apple Inc. Mostly used by Apple devices, like the videos shot by iPhone. By the way, if you were an Apple enthusiast with full house of Apple devices, due to the compatibility issue, converting all the videos you own to MOV format would be a good choice. By merging MOV files, you’ll get a big, full and seamless video combined with the video segments that you shot or download. In that case, you’ll acquire an uninterrupted viewing enjoyment instead of viewing the segment one by one, which is troublesome and frustrating. 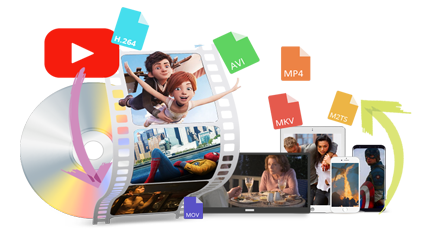 A two-in-one software containing full HD Video Converter Factory Pro features and DVD-Ripping function, save the moments worth treasuring now.